!!!!!! Thank you HarperCollins !!!! I finally, finally got Shattered Souls from the library! My awesome hubby bought me bookshelves! I officially have my own personal library. Great haul. You have a wonderful husband. Your husband loves you because he got you shelves. I wish my mother would understand my book obsession disorder. You got some great books. Trust me you will have no problem filling up those shelves. I love love love your bookshelves! So chocolate colored and uniform! All of my bookshelves are different colors and sizes/shapes. You will no problem filling it up!! Love these bookshelves! So pretty! Oh my gosh! those bookshelves are awesome! I'm sooo jealous! I am so eager to find a copy of Article 5. I can't wait to read it. Enjoy your books! Belated Happy Birthday! Your bookshelf is stunning. I am envious! I want one. I just finished Fallen in Love tonight! It's cute. Ahhhh!! Dreamless! I can't wait to read it. Enjoy and we have discuss Dreamless after we've both read it. 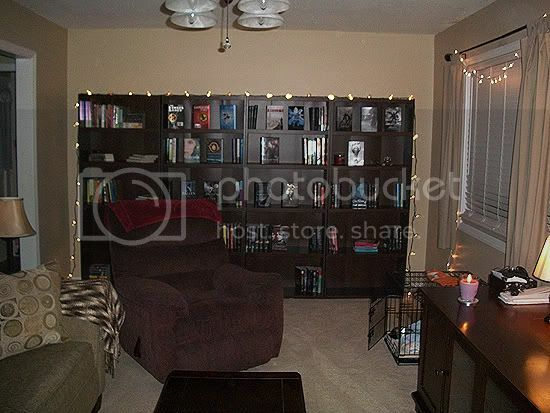 Beautiful bookshelves, Christy! :D Your husband has great taste. Also, WOO-HOO to getting Shattered Souls and Dreamless! I really hope you enjoy Shattered Souls as much as I am right now. Fabulous book. Enjoy your books AND your new home library! 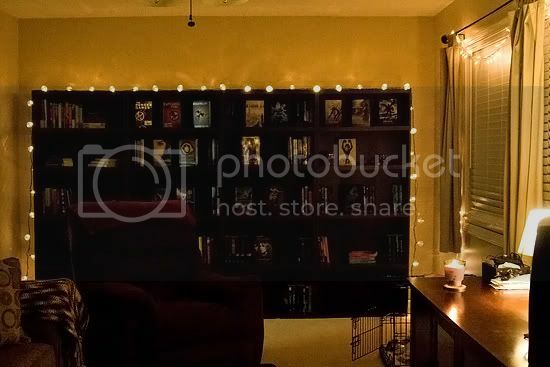 I really need to get new bookshelves too, and I love the lights!! My IMM: Hippies, Beauty, and Books. Oh My! My bookshelf is like a tenth of that lol. The shelves are so pretty :) Happy reading! I'm so jealous of your bookshelves! :) Fallen In Love is really popular this week and I should get around to reading it. Happy reading! 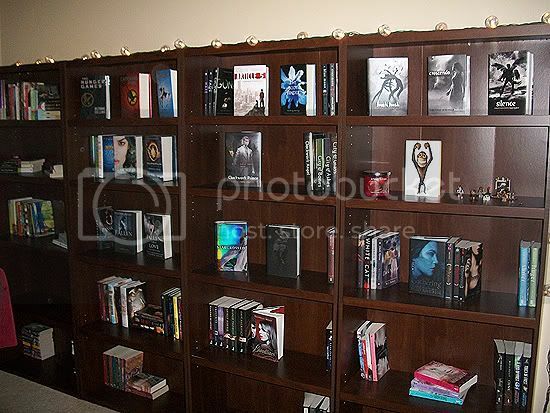 Girl, your bookshelf is AMAZING. There's plenty of space and the lights are just lovely. Eeeee! Dying to read Article 5 and Shattered Souls. And I really can't wait to read both Arriane and Roland's stories in Fallen in Love. You had a great week! I'm curious about Article 5, it sounds interesting! You're shelves are awesome! I have a new shelf I'm just waiting on hubby to help me clear out the extra bedroom so that we can make it a mini library! But you know how that goes...Love the string lights. Love the new bookshelves- enjoy! The room looks great. I am especially excited or Dreamless. 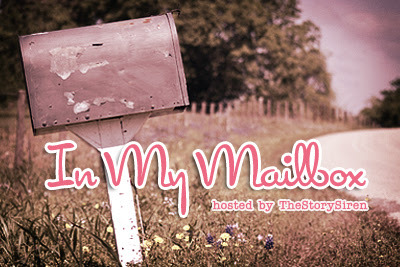 Can't wait to hear your thoughts! I'm in love with your bookshelf! OMG! Sooooooo love the bookshelves! I don't have enough room for that many. And with my niece in the house I'd rather keep them away from her! ;) Hope you enjoy all your new reads and your shelves! What a magical room! I really want a huge bookshelf like yours! Mines all tiny and overflowing with books! Not pretty :( Lol keep your man, he's a good one! I've heard of all of the books you got this week! And can I please say that I'm jealous!! Oooh! Love the wall of bookshelves! So gorgeous! You should add some pictures and brick-a-brac until you fill those shelves up. I love your booksheves, it's so beautiful! If only I had one like that lol. I hope you'll enjoy all your books! Happy birthday! I love the bookshelves, and the lights around them are a great idea. Your recliner looks comfy ;-) Can't wait to have a permanent home so I can do big bookshelves and recliners too. Now fill up those shelves! Love your bookshelves! That room looks so inviting and cozy! Dreamless is amazing!!! I got an ARC last year. I finished it and wanted to start all over again!! article 5 looks good. You bookcase looks beautiful! Great haul :) !! I'm dying to read Article 5. And I look forward to read your reviews ;) !! Those bookshelves are gorgeous! I love them :). And so jealous of Dreamless! You lucky thing. Article 5 sounds amazing too - happy reading :). Oh, happy belated birthday! Seems your hubby knows you very well--those bookcases are gorgeous. I can just picture curling up with a good book in that cozy recliner (I have an equally ugly chair that's so comfy, I don't want to part with it). Happy reading! Happy Belated Birthday!!! Your husband is awesome for getting you those shelves. LOVE the new shelves! And the recliner looks like the perfect reading chair! Happy belated birthday and I love your shelves! I got Dreamless this week and cannot wait to start it! Shattered Souls look amazing!!! And wow!!! bookcases look so good.